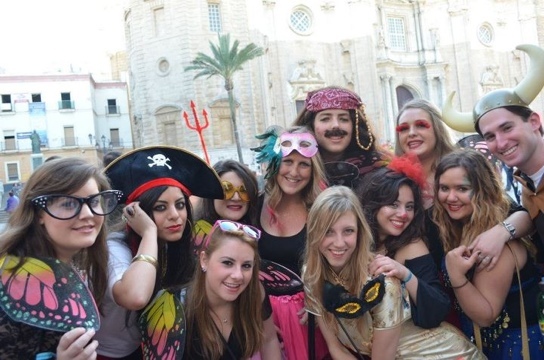 ¿How Crazy Can You Carnaval? Think you can handle the third biggest Carnaval celebration in the world? 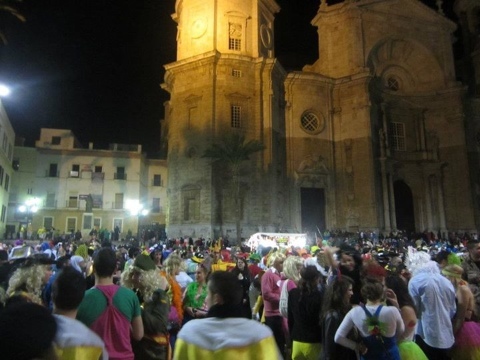 Well, that’s just what we set out to do this weekend in Cadíz – a beautiful beach city on the southern coast of Spain that comes to life during the weeks of Carnaval, where thousands gather to drink in the streets and show off their clever costumes. It’s kind of like Halloween at Santa Barbara. On steroids. Yet it was the one occasion we could justify our partying as part of the “cultural experience.” So, although it was a large responsibility, we rose to the challenge and got our butts down there. After spending most of my time in Europe on a tight itinerary to make sure I learned everything about every museum and monument that ever existed, the weekend provided a much-needed break with absolutely no responsibilities. So we took advantage of the opportune weather and beautiful beaches, starting with mimosas at breakfast and some lazy drinking and tanning by the pool throughout the day. After spending most of the weekend riding a pretty nice buzz, we were ready for a good time at the festivities Saturday night. Here’s one thing you need to get straight: there is no half-assing at Carnaval. You go all out or go home, so I was proud to be heading down with some boys who had the balls to wear a chicken and Pink Panther suit. What we hadn’t realized ahead of time, though, was that every group of friends dressed up in theme together – and they get damn creative! We saw a group of blue Twitter birds (advertising their handles, of course), the characters of Pac Man, and even a group of cronies from Clockwork Orange. The most surprising thing I noticed was how unrevealing the girls’ outfits were. While most people will use any excuse they can to dress *ahem* a little bit risqué (just take Mardi Gras in New Orleans, for example), these girls were dressing in full-body cow costumes! You even had groups of middle-aged men and women dressing up and going out with their friends. It was the sweetest thing, and definitely a big difference from the traditional sequined and beaded bikinis and headdresses I saw on the Carnaval dancers at the clubs in Madrid that week. Apparently Cadíz is actually known for being quite the witty town of Spain. Between the street venders with Spanish sandwiches and almond candy, the two-euro liters of sangría you could drink openly in the road, and the packs of spirited Spaniards, the streets of Cadíz were a pretty great place to pass the night. But now I think, naturally, the next celebration will be Brazil – the Carnaval Capital of the World.